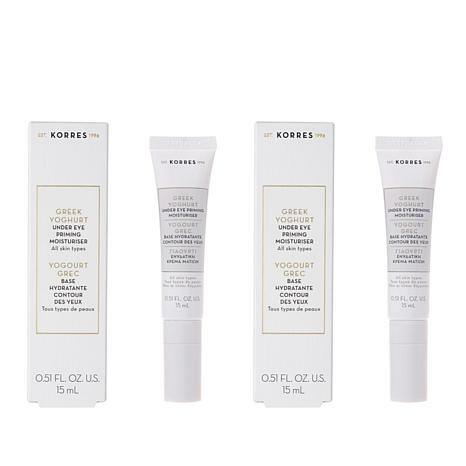 Korres Greek Yoghurt Eye Cream Duo - .51 fl. oz. 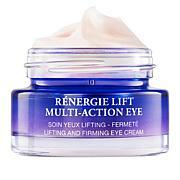 This advanced nourishing eye cream is formulated with yoghurt, a centuries-old Greek skin soothing solution. 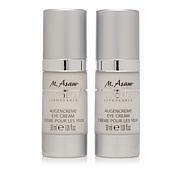 The instant eye cream moisturizes and primes the eye area before makeup application. 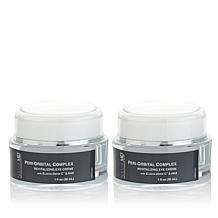 The cool ceramic tip gently massages under eyes with each application. 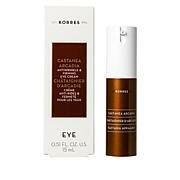 KORRES YOGHURT EYE CREAM .51 fl. oz. Ingredients: AQUA/WATER/EAU, CAPRYLIC/CAPRIC TRIGLYCERIDE, TRIHEPTANOIN, SUCROSE STEARATE, GLYCERIN, SIMMONDSIA CHINENSIS (JOJOBA) SEED OIL, BETAINE, ACACIA DECURRENS/JOJOBA/SUNFLOWER SEED WAX POLYGLYCERYL-3 ESTERS, BUTYROSPERMUM PARKII (SHEA) BUTTER, HYDROGENATED C12-18 TRIGLYCERIDES, GLYCERYL STEARATE CITRATE, DICAPRYLYL ETHER, DISTARCH PHOSPHATE, SUCROSE, SUCROSE DISTEARATE, ADANSONIA DIGITATA (BAOBAB) PULP EXTRACT, ALANINE, AMMONIUM ACRYLOYLDIMETHYLTAURATE/VP COPOLYMER, ARGININE, BENZYL ALCOHOL, BRASSICA CAMPESTRIS (RAPESEED) STEROLS, DIAZOLIDINYL UREA, ETHYLHEXYLGLYCERIN, GLYCERYL CAPRYLATE, GLYCINE SOJA (SOYBEAN) OIL, HYDROLYZED MYRTUS COMMUNIS LEAF EXTRACT, LONICERA CAPRIFOLIUM (HONEYSUCKLE) FLOWER EXTRACT, LONICERA JAPONICA (HONEYSUCKLE) FLOWER EXTRACT, MENTHYL LACTATE, MOURERA FLUVIATILIS EXTRACT, PARFUM/FRAGRANCE, PCA, POTASSIUM SORBATE, PYRUS MALUS (APPLE) SEED EXTRACT, RHODIOLA ROSEA ROOT EXTRACT, ROSMARINUS OFFICINALIS (ROSEMARY) LEAF EXTRACT, SACCHAROMYCES CEREVISIAE EXTRACT, SALICYLIC ACID, SERINE, SODIUM BENZOATE, SODIUM GLUCEPTATE, SODIUM HYALURONATE, SODIUM PHOSPHATE, SODIUM STEAROYL GLUTAMATE, SUNFLOWER SEED OIL SORBITOL ESTERS, THREONINE, TOCOPHEROL, TOCOPHERYL ACETATE, XANTHAN GUM, YOGURT POWDER. 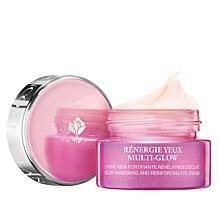 This eye cream is simple and effective, especially worked well on my swollen under eye area. And the cooling tip is so soothing. Will become my go to Eye product. Oh and you get TWO!!! I watched the presentation and really, really wanted this to address my puffy eyes like they said it would. I'd have to say don't see too much help in that department. Going to keep but will not order again. 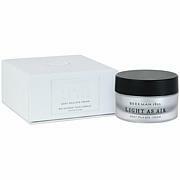 I love Korres body butters and shower gels but, the eye cream made my skin under my eyes burn. It just wasnt for me.